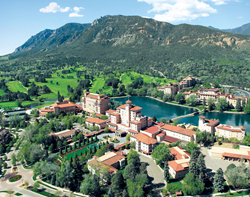 The Broadmoor in Colorado Springs, Colorado, presents the 4th Annuall Women’s Weekend of Wellness, welcoming women of all ages to reboot the mind, body, and spirit and unleash their inner athlete. Held this year on April 14-17, 2016 and co-sponsored by the University of Colorado (CU) Anschutz Health and Wellness Center, this transformational weekend is focused on providing the tools and resources women can use to surmount the challenges they face in life, whether personal, professional, or physical, through a number of interactive seminars and exercise-based activities. Led by doctors and specialists from the Denver region and the CU Anschutz Health and Wellness Center, the seminars offer a holistic approach to gaining the physical, emotional, and mental fortitude for women to achieve their goals. Keynote speaker this year is ultra-marathoner DIANE VAN DEREN. A world-renowned and North Face-sponsored athlete, Diane shares her inspiring life story as an ultra-marathoner who won the grueling, 300-mile Yukon Arctic Ultra in 2008, had a lobectomy in 1997 to cure debilitating epileptic seizures and since then has won numerous ultra-marathons and was the first woman to finish the 430-mile version of the Yukon Arctic Ultra. Van Deren details her difficult yet inspiring journey and how her life-altering surgery has brought both joy and challenges to her life, offering motivation to participants and ideas for how they can bring the same mental toughness into their own lives. For those staying three nights, the weekend begins with a special welcome reception of cocktails and healthy hors d’oeuvres, hosted by The Broadmoor’s Spa Director Cassie Hernandez. “Human Performance” presented by Shanon Squires, the Human Performance Lab Coordinator at the CU Anschutz Medical Center. Certified in exercise physiology and a metabolic specialist, Squires’s session focuses on wellness, weight loss, and working with the body’s metabolism to optimize both. “Climbing Out” presented by Dr. Annie Moore, an internist and associate professor of medicine at the CU Anschutz Medical Center, explores how women can face their fears head on by safely moving out of their comfort zone and tackling new challenges. The afternoon features a variety of activities, including a tour of the Olympic Training Center in Colorado Springs or a Tai Chi class. In addition, those invigorated by a truly unique and demanding physical activity can participate in the “Ultimate Seven Falls Challenge,” which includes a 2.5-mile bike ride through Seven Falls, the box canyon known as "The Grandest Mile of Scenery" in Colorado, followed by strength training exercises at the base of the falls. Participants then ascend the 224 steps of Seven Falls followed by a mile-long trail run to and from Midnight Falls. The activity concludes with a three-mile, moderately intense mountain bike ride on a dirt road that winds through Colorado's mountain landscape. Evening presents an interactive, chef-led cooking demonstration of easy to prepare, healthy food options, followed by a plated dinner provided by The Broadmoor’s renowned culinary staff. “Loving Yourself First,” presented by Dr. Rina Shinn, a cosmetologist and aesthetic surgeon and founder of Adonis Cosmetic Surgery and Spa in Pueblo, Colorado. Dr. Shinn will discuss that the key to happiness starts from the inside rather than just changing one’s appearance. “Managing Complex Change," presented by Dr. Nancy Hamilton, a Colorado native who has worked as a psychotherapist, executive coach, and motivational speaker for the past 23 years. Dr. Hamilton explores how to embrace challenges with humor and break unhelpful patterns in order to live with purpose and intention. Following lunch, choose from an array of activities, including a golf or tennis clinic, tai chi, or The Broadmoor Boot Camp, a circuit-style session that offers cardio, core, and strength training through a variety of exercises. Breakfast and keynote speaker Diane Van Deren.